Can a Gluten-Free Diet Improve Your Health? Could cutting gluten from your diet improve your health, help you lose weight and feel better? If you have a gluten sensitivity, like close to 10% of the population, yes! With all of the gluten-free products sprouting up on the market and talk of gluten intolerance these days I thought it’d be useful to shed a bit of light(?) on this hot health topic. Gluten is a protein compound found in many cereals such as wheat, barley, rye, oat *, kamut, spelt and triticale. Gluten, as its name suggests, is responsible for the elasticity and viscosity of the flour paste that makes bread. One then finds gluten in many foods such as breads, pastries, pasta, but it is also used by the food industry as a binder in some sauces, yogurt, processed meals, etc. This being said, now that people are eating more processed foods they are also consuming more gluten. What is so bad about gluten? Nothing if you are not intolerant or allergic. Two categories of people are recommended to cut gluten from their diets; people who have celiac disease (also known as a gluten allergy) and those who are gluten intolerant (gluten sensitivity). Wheat is one of the eight most allergenic foods and celiac disease is said to affect 1% of the population. 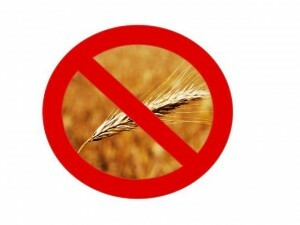 Non-celiac gluten sensitivity on the other hand affects 5 to 10 % of the population. Both of which are highly underdiagnosed, many people affected live with symptoms for years before discovering it to be the cause of their health problems. Many people who have no gluten allergy or intolerance have also benefited from increased wellbeing and health due to the fact that avoiding gluten means avoiding most junk foods and processed foods. You must therefore eat more homemade whole foods which is always a good thing. Gluten intolerance, because its symptoms are not so severe (may include flatulence, abdominal pain, abdominal distension and diarrhea) may be harder to diagnose. Celiac disease is an autoimmune disease that affects the sides of the intestinal wall. Symptoms are much more severe, they may include skin rash, wheezing, lip swelling, abdominal pain and diarrhea. According to certain theories people affected with intolerance may develop other inflammatory diseases as a repercussion of long term gluten consumption, such as type 2 diabetes, fibromyalgia, arthritis, fertility problems… Also, because an allergy or intolerance to gluten affects your intestinal wall it means that your nutrient absorption (which occurs in the intestines) is compromised. This can lead to osteoporosis due to malabsorption of calcium, iron deficient anemia, and poor absorption of other important vitamins and minerals essential for proper health. Why the sudden upsurge of gluten sensitivity? Although some previously believed that gluten sensitivity and celiac disease are more common nowadays due to increased detection and awareness, it has recently been proven that 50 years ago these were much less common. Why the sudden upsurge of gluten sensitivity? Pure wheat flour has only been part of the western diet for the last 200 years; it was previously combined and milled with other grains and seeds. With the mass cultivation of wheat, it is now much more economical to make breads consisting of only refined wheat. Modern wheat is very different to what it once was as a result of hybridization of the grain, it now contains significantly higher amounts of gluten. The current high gluten containing diet is not what our ancestors were eating therefore making it harder for our bodies to digest and recognize. Look out for upcoming gluten-free yummy recipes.